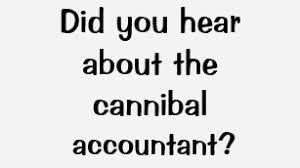 Q: Did you hear about the cannibal CPA? A: She charges and arm and a leg. Join in and write your own page! It's easy to do. How? Simply click here to return to Your Jokes.